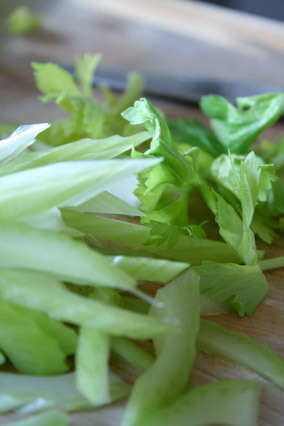 Do you always have some leftover celery in your refrigerator? And aren't you tired of eating it with dip or in salad? For some reason, celery is one of the slowest things I am able to use in my refrigerator. 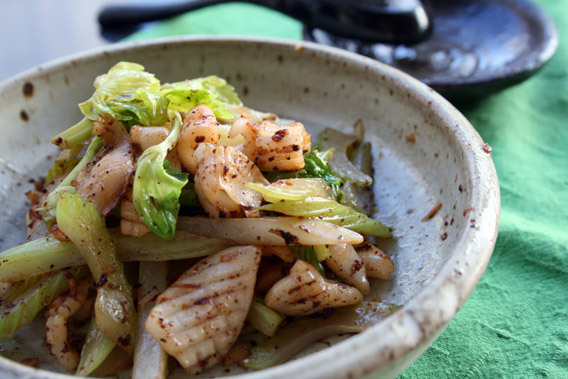 My favorite way to use celery is in stir fry, and I especially like the combination of celery and squid. 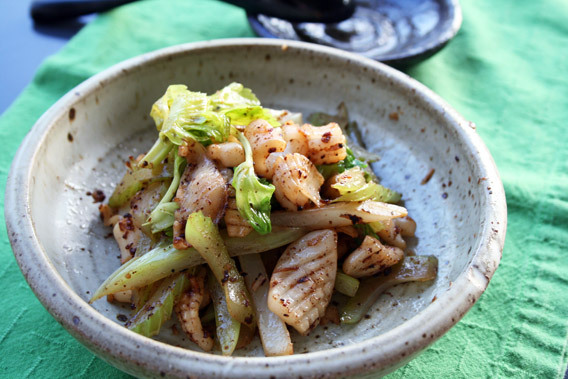 The tender squid and crispy celery make a very nice texture contrast. Squid is always in my freezer as well since I can't always find fresh squid and sometimes I have to buy frozen. 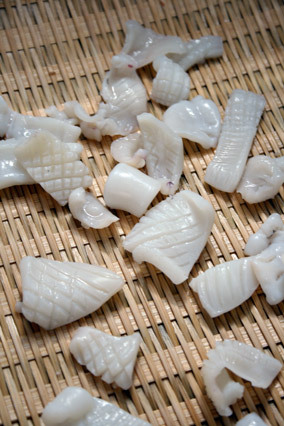 And frozen squid usually comes in a large portion and it is hard to use it all at once. 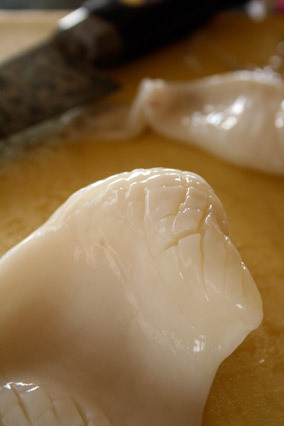 With a kitchen scissor or a knife, cut one side of the squid to open it. With the tip of a very sharp knife, score the squid diagonally (1/16" - 1/8" intervals). Do not cut all the way through. Turn the squid 90 degrees and score the squid diagonally again to make a criss-cross pattern. Cut the squid into bite size pieces and spread on a colander. Place the colander in the sink. Pour boiling water over the squid and drain well (or boil water in a pot and blanch the squid in the hot boiling water for a few seconds and drain). Heat oil in a fry pan on high heat. 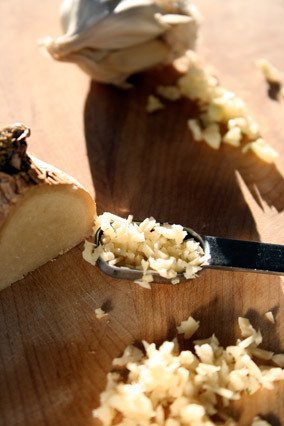 Add garlic and ginger and saute until fragrant without burning them -- about 30 seconds. Add the celery and the squid and saute about 2 minutes or less. Add celery leaves and toss. Add sake, soy sauce, salt and pepper and stir well. Drizzle sesame oil around the pan and stir one more time and remove from the heat. Plate and serve.